When it comes to fancy legal workplaces, it’s hard to compete with the world famous skyscrapers that London’s top law firms call home. But increasingly barristers’ chambers are giving it a go, as the leading sets plough a portion of their hefty resources into pimping up their gaffs. Add high-end interior décor and slick technology into buildings located in the charming alleyways and passages of legal London, and you get quite an effect. Ten chambers out of 50 scored an A* for facilities in the Legal Cheek Junior Barrister Survey of over 600 bar rookies. Among them were two magic circle sets, where barrister earnings dwarf even the megabucks of City law firm profit per equity figures. So little wonder that Blackstone Chambers — home of household name QCs such as Dinah Rose and David Pannick — has the exclusive vibe of Davos private jet frequent flyers’ lounge. For other sets, the natural beauty of their surroundings is enough. 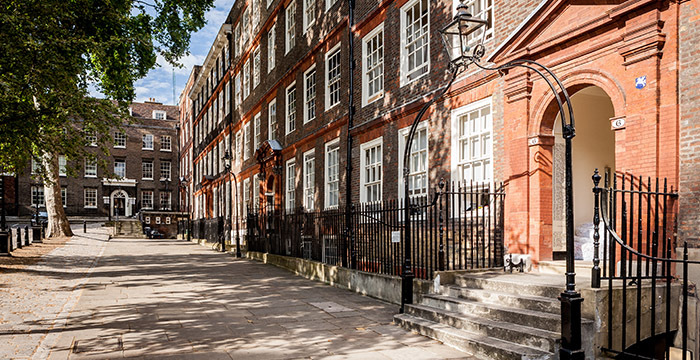 “I have a room overlooking Inner Temple Gardens at the Thames — it is pretty good!” says a 2 Temple Gardens barrister. Another argues that “we’ve got the best views in Temple” while noting the “lovely Dickensian chic atmosphere” of the Middle Temple gateway location that featured in, among other films, Mission Impossible. Up the road at Gray’s Inn, the vistas are similarly delightful. “We all have our own rooms and they are all good-sized to very large. Most have views over Gray’s Inn gardens. We have excellent facilities for meetings etc and great support staff for IT, billing and facilities management,” a 3 Verulam Buildings junior muses. Continuing our tour, we arrive at Lincoln’s Inn. With three separate sites in close proximity, barristers from Radcliffe Chambers are a common sight. The fast-growing, and fast–modernising, set offers its members some of the best support around — and judging by their survey results they seem to quite enjoy their mini-commutes across New Square Gardens. Meanwhile, Fellow Lincolns Inn-er, 4 New Square, may be just another Georgian townhouse from the outside, but get inside and it’s 5* boutique hotel meets avant-garde yoga retreat — with functioning IT to match! Not that all the chambers with the best facilities are in the Big Smoke. Exchange Chambers — with offices in Liverpool, Manchester and Leeds — lives up to its Northern Powerhouse grandee status with “mood lighting, plush carpets and vast space”. Peruse all of the chambers’ new 2018-19 survey scorecards — including training, quality of work, colleagues, facilities and social life — via the Legal Cheek Chambers Most List 2019. Previously: The best chambers for training; The best chambers for quality of work for juniors; The chambers with the most supportive barristers. I have mood lighting in my office. And a leather couch. So what? …and a handycam built into a fake office plant. It’s all relative. I’m just happy to have toilet roll in the bogs now. Legal cheek please disclose how many people you survey, which chambers they are from and how many chambers who make your top rankings have sponsorship ties with legal cheek. It’s only fair for people who are seeking pupillage to have a clear idea as to whether these kind of articles are accurate reflections of chambers or merely paid for plugs. Yeah. Even where the criteria are completely objective (e.g. chambers most list, ranked by pupillage award), they just skip over sets with 30k+ awards and list one that offers 25k (at least they did last year). Lol. Hardly spoilt for choice when you seek pupillage. If a chambers offers you one and you have to sit on a cactus in a branch on Isle of Wight then you take it! Exchange Chambers annexe, was it? Sure, but it’s annoying when LegalCheek and other publications ignore smaller chambers. I literally didn’t know my current chambers existed until a BPTC careers advisor gave me a list of Non-Gateway sets she’d compiled. It’s a London set with a solid pupillage award – so there is no clear reason why it’s never mentioned. Getting pupillage is hard. That’s precisely why it’s not helpful when websites like LegalCheek focus only on a handful of sets, which tend to be those where everyone has an Oxbridge 1st and a BCL. So? The Greenberg Glusker LLP office is filled with priceless Renaissance art. Good for you, this was probably the first GG LLP funny comment I’ve read on this website! Chambers which spend lots of fee income of facilities are good ones to avoid! It will be your money they’re spending. It really depends. Nice meeting rooms, good environment for a staff and competitive packages for staff, functioning IT etc are obviously decent investments. And frankly, when it comes to the likes of Blackstone it’s not “your” money they’re spending in the main, assuming “you” are a junior barrister. Chambers contributions depend on earnings, and it’s the bsd QCs who contribute the lion’s share, even if there’s a cap on contributions. Does this survey reflect all chambers, or only those who pay you money? The chambers which wasted its members’ rent on Legal Cheek marketing – 2019 edition. What’s missing from these LC ranking are those sets who don’t make top dollar. This is a ranking of good commercial sets only. Not a ranking of chambers generally. Garden Garden isn’t an elite set by any stretch. Basically full of shouty class warriors. Hmm Band 1 for immigration, Band 2 for public law and human rights. I don’t think there is a case for saying it is not an elite set (in its practice area). But I agree they are shouty class warriors. Hardwicke – dreadful looking 70s building. 39 Essex – not a building but an anchor dragging them down. I’ve been inside Harwicke. It’s no better on the inside than the outside. 39 have good clerks and a great summer party. Barristers are decent enough. Dilapidations is such a con. Surely the business pays rent to the building owner and shouldn’t have to pay extra because the building gets natural wear and tear over that time. Is that the deal at 39? Cripes. Similar set, my rent is 15%. I’ll take failing photocopiers for that difference. Does the telex machine work? Byrom Street Chambers have excellent conference facilities stuffed with paintings and other objects d’art, a fairly substantial fish tank full of very pretty fish, and inexhaustible supplies of very good tea, coffee and biscuits. Why are they not on your list? Is it because they have the apparent good sense not to pay you? 13KBW (as was) had a fantastic view out over the Thames. More codswallop from the yellowest press in town. 2TG are top of the list of chambers facilities based only on the fact that they have a view? Hardwicke have a large marketing team that costs far too much and has achieved little more than a few more insurance-backed CFA contracts. This partial backhander-funded chambers reviewing has to stop. 2TG is a good set but their toilets are a joke. Rather than all of this guff about views, I don’t suppose you could ask people what they are earning? I love the Bar, but let’s be honest, I’m doing it for cash. I would love to know what a 1, 5 and 10 year junior is expected to make on average at various sets. Appreciate it will be an average, but if you are going to rack up huge debts, you need to know whether the pupillage award flatters the set.